Magnum ES42 Edge Switches go out where the action is. 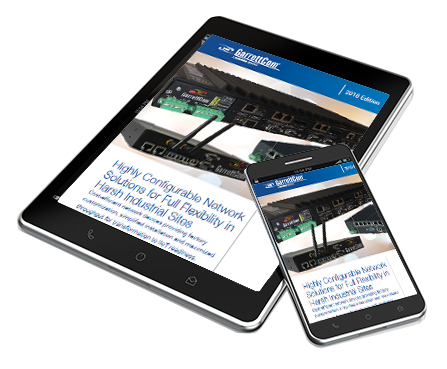 In heavy-duty industrial applications, Ethernet LANs increasingly are used where small groups of nodes at the edge need to be connected into larger LAN structures. 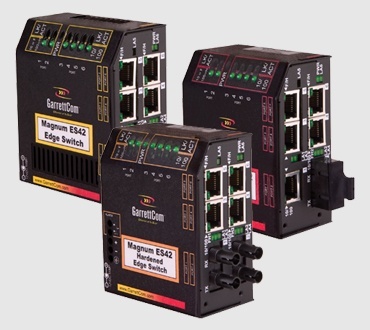 The Magnum ES42, a versatile family of small Edge Switches, uses the latest networking technology and innovative product packaging features to serve edge-of-the-network applications. The compact ES42 Edge Switch design delivers six Ethernet ports. The base models have either two 100 Mb fiber and four 10/100 copper ports, or one fiber and five copper ports, or six copper ports. Fiber port choices cover all multi-mode and single-mode fiber connector types. Power input selections include AC or DC (or both) with 12V, 24V and 48V DC terminal block models for all industrial application environments. Port Flexibility - Offers 6 switch ports, 1 or 2 of which may be 100 Mb fiber, others are 10/100 copper. Link-Loss-Learn (LLL) - Includes (LLL) feature for use in self-healing LAN structures.